What is Prospect Movie About? Prospect Movie is a DVD for baseball’s most advanced players. It features 6 Major Leaguers, 18 Division I college coaches, and 3 professional scouts all communicating how to get to the next level of college or professional baseball and how to succeed once you’re there. – Ordered by over half of the first round high school draft picks every year. – Will give players an edge going into higher levels of baseball. – How the best players see the game, make adjustments, and prepare themselves to be successful. – What the best coaches look for and try to instill in their players as the game gets quicker at the higher levels. – The mindframe the best use to handle the slumps and streaks inherent in baseball. 24.99 for an hour and forty five minutes of advice from baseball’s top players, coaches, and scouts. “A baseball buddy of mine from college sent me a copy of this video and it’s not an exaggeration to say that watching this and taking the advice to heart could change your baseball life. But I have to admit that watching “Prospect” made me a little upset. Hearing the players, coaches, and scouts talk about all the different aspects of the game – both mental and physical – made me realize that my baseball career didn’t have to end after graduating. I was a scholarship player at a Division I program and feel confident that I had draftable talent. But my potential in certain aspects of the game was not reached and it’s a shame that this video wasn’t around 5 or even 10 years ago. There are a number of gems in these volumes, and to hear them from the likes of Francona and Wright brings the message home even more. A number of people have asked what the video is about and what they can expect. Well expect a pleasant surprise. This movie is not like all the other shameless, late night cable-advertised “how to” videos that charge you money for what you could learn from Tim McCarver or Joe Buck on Sunday night baseball. This video is not going to teach you how to hit or throw a curveball, how to run first-and-third defenses, or how to execute a hit-and-run. What it is going to teach you is how to put yourself in the best possible position you can be in when the draft arrives. And let me tell you, it’s never too early to prepare. If you’ve ever wondered what the scouts or college coaches are looking for or where your game needs to be to even sniff a 161 game season, then these volumes are for you; and what’s more, the answers come straight from the players, coaches, and scouts themselves. Copyright © Prospect Movie 2019. All Rights Reserved. This film was made because of the coaches, scouts, and players who were willing to share their experiences with us. We are forever grateful. 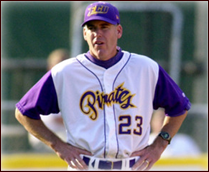 However there is one coach I was unable to interview for the film – Keith LeClair. He is the man who transformed East Carolina University into a national caliber program in the matter of a few seasons. I could not interview Keith LeClair because he was diagnosed with ALS. I had an opportunity to play for Coach LeClair in 1998. Afterwords, people I knew would ask why his teams were so tough to beat. I always told them it was because if he asked anyone on the team to go lay down on a four lane highway, they would do it. They would do it believing he knew what he was talking about and knowing he would not put them in danger. He was that type of leader. In the name of all the people who made this film possible, a portion of sales will be donated to a charity dedicated to ALS research.